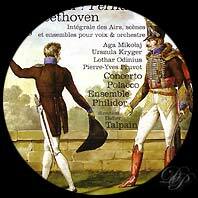 This remarkable CD collects 5 Italian airs and ensembles and 4 German airs. Conducted with mastery by Didier Talpain, the period instruments of the Concerto Polacca and the voices of the Ensemble Philidor transport us into the domain of the frequently underrated vocal works of Beethoven. (Re) discover without delay. - Tremate, empi, tremate, opus 116. - Mit Mädeln sich vertragen, WoO 90.